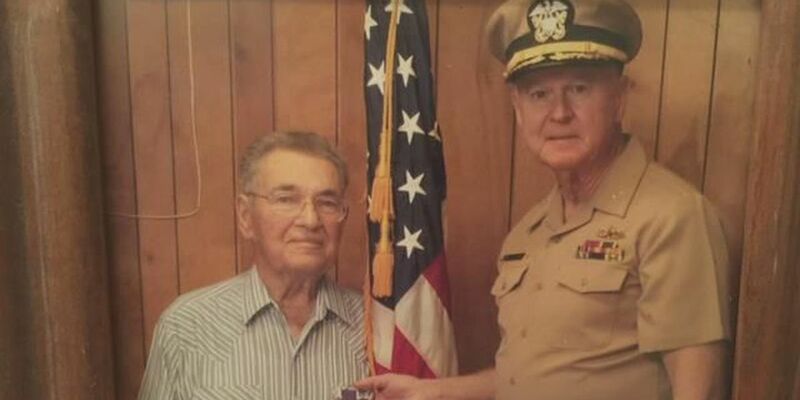 LAKE CHARLES, LA (KPLC) - A Vietnam veteran of the Navy, Joe Hill continued his military career helping other veterans. After graduating OCS, Joe Hill went on to the Navy JAG school to become a Navy legal officer. He later found himself doing 2 tours of duty in Vietnam on board the U.S.S. Pyro. "We had people ashore and at that time it was top secret," said Hill. "The second one was a shooting war. Our job was to keep the combatants: the destroyers, the cruisers, the aircraft carriers... full of bullets." After the war, Hill got involved in Navy intelligence. "I felt very privileged for Operation Homecoming in which we interviewed all of the prisoners of war from the Vietnam War and heard their stories and helped shoe spoon them back into a country that they didn't even recognize." While working for U.S. Rep. Charles Boustany, Hill was honored to present World War II veteran Thomas Duhon with a Purple Heart that was long overdue. The ceremony took place in front of family and other veterans.
" I told the crowd that those who feel comfortable in standing, please stand up and come to attention. So I read the citation, pinned the medal on him and I have to tell you, John, it was one of the greatest moments of my life. It was huge. Thomas Duhon was dying from cancer at the time, but fully appreciated the effort to get his Purple Heart. Hill also helped co-found the local Sea Cadets chapter and the Junior ROTC program at LaGrange High School. Copyright 2015 KPLC-TV. All rights reserved.